Security Agreements: When there is a lien on a patent by a bank, shareholder, or other entity. Security Releases: When the security agreements listed in number 3 are released by the lien holder. The assignment data is up-to-date to the nearest week after each weekend's indexing. 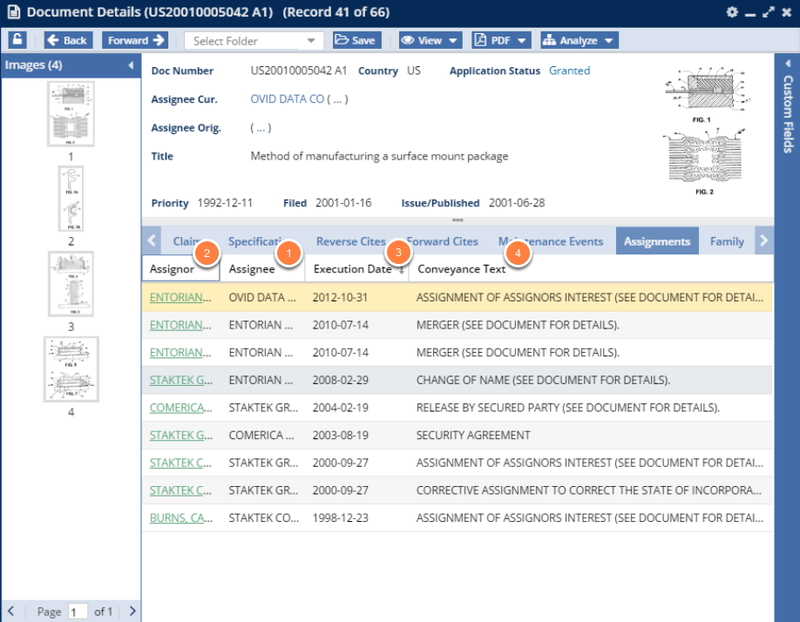 However, we do provide a direct one-click link to the same data on the USPTO.gov website to help you confirm the accuracy of the assignment data. Simply click the green link under the Assignor column. The rows in our assignment records are sorted by default with the newest event on top. Generally this is the most useful presentation and the easiest to read, but the rows are sortable by clicking the various column headers and sorting ascending or descending (you can also remove or re-add one of the columns here). 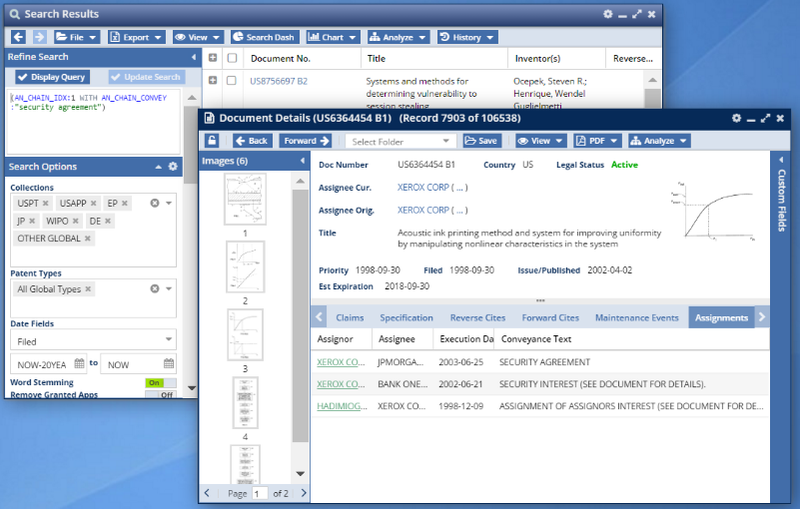 The AN_CHAIN_NAME field code queries the Assignee column (1) in the patent record. 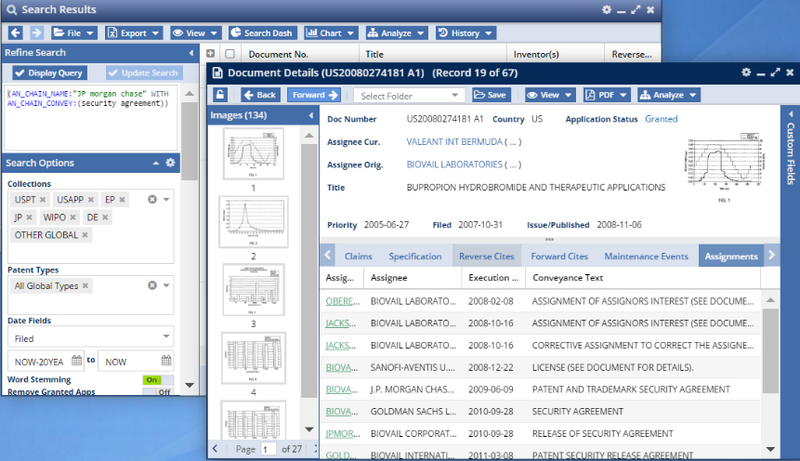 Querying the AN_CHAIN_NAME field would match this '042 patent above if you queried "Ovid Data," "Entorian," or "Staktek" since all these names are found in the Assignments>Assignee column (1) above. AN_CHAIN_CONVEY (4) --> This queries the Conveyance Text. For example: AN_CHAIN_CONVEY:"change of name"
AN_CHAIN_PNAME --> This is the Previous Name. This is a derived field with no match in the original source data. The field attempts to provide a more consistent view of a chain of events. The field would usually be used in addition or instead of the assignor name field. AN_CHAIN_IDX --> The index number of the assignment event in the record, where 1 the most recent. For example: AN_CHAIN_IDX:1 WITH AN_CHAIN_CONVEY:"Security Agreement" --> This example would bring up documents like the example below, where the Security Agreement is the most recent assignment event. The WITH operator can be used when querying assignment data. The WITH operator requires that the data in two different Assignments fields be in the same sub-record (same row in the Assignments tab). AN_CHAIN_NAME:"JP MORGAN CHASE" WITH AN_CHAIN_CONVEY:(Security Agreement) --> In this search, both JP MORGAN CHASE and the words "Security" and "Agreement" must to be in the same sub-record for the patent to match. In the example below, if "security agreement" was ONLY on a line with Goldman Sachs and the mention of JP Morgan Chase was, say, only on the "License" line (in place of Biovale or Sanofi-Aventis), this record would not show up in the search results list for this query.